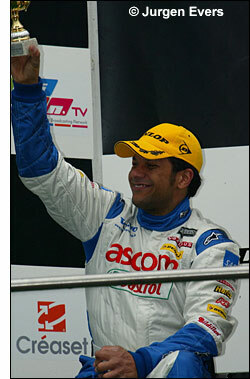 The first BTCS race was a wet thriller, with different leaders, incidents and a well-deserved win for KS Motorsport. 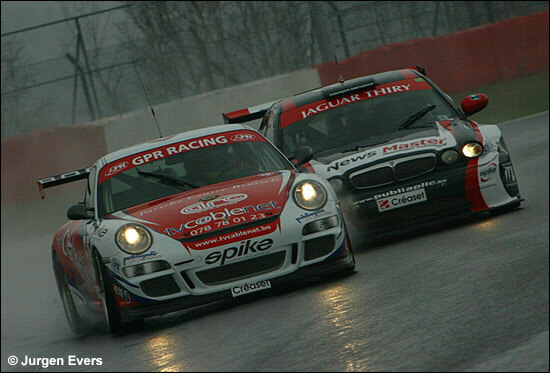 Marc Duez started very well in the #55 Porsche 997, and overtook the leading Jaguar on lap 2. The Audi meanwhile did not even start the season’s opener owing to broken suspension. During the opening stages Duez in the Porsche, both Jaguars and the Euromaster and KS BMW Silhouettes showed what racing is about. At halfway Duez still led but both the #1 Jaguar and the #2 Euromaster BMW dropped back after a collision. Owing to a flat tyre just before the one hour mark, the #55 Porsche, by this time in the hands of Van de Wauwer, also lost some places. Steve Van Bellingen and Armand Fumal took the lead with their KS BMW. The former brought his car home in first position (above) after a canny stint in very difficult conditions. 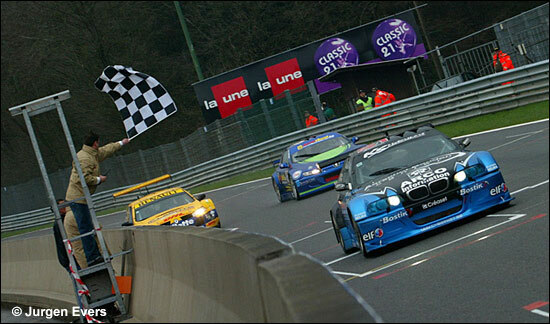 Behind him the Renault of Vosse / Bouvy and the BMW of Slaus / Lupant took the other podium spots. 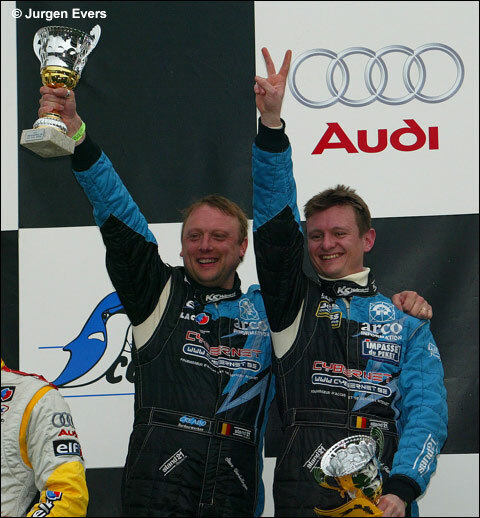 Duez and Van de Wauwer, fourth overall, won in GT, while a superb Jason Watt (right) came home second. He drove all by himself in a specially adapted GRP Porsche 997. The beautiful BPO Ferrari’s 360 retired with a broken engine and a gearbox problem. The second race is almost impossible to relate in a few lines. Until halfway, we saw a gigantic battle – in dry conditions - between Steve Van Bellingen in the KS BMW, Thiry and Mathieu in their Jaguar X-Type and Hemroule in his Audi. Vosse in the Mégane, Lupant in the Euromaster BMW, Van de Wauwer in the GPR Porsche and finally Hardman in another BMW were fighting their own battle about half a minute behind the leaders. Once all the teams changed drivers, the battle resumed. 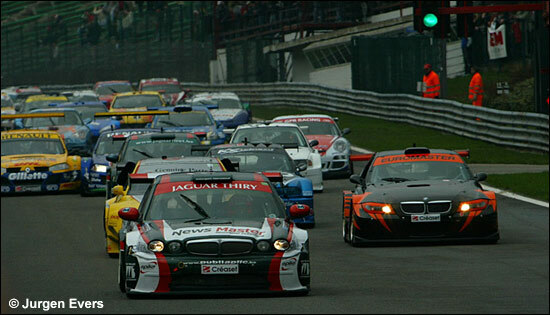 Chouvel (Jaguar) overtook the BMW of Fumal for the lead but lost the lead after his Jaguar broke down. With only 15 minutes to go, a typical Francorchamps shower forced the teams to gamble. The Audi squad did the right thing by changing tyres immediately but an engine problem put an end to victory hopes. KS Motorsport took advantage of the troubles of the Audi and won for the second time today. Hemroulle and Verbergt made it home second and rainman Duez took third, and first in GT, with his GPR Porsche.